Hong Kong election, protests: Law will remain unchanged, city leader says. 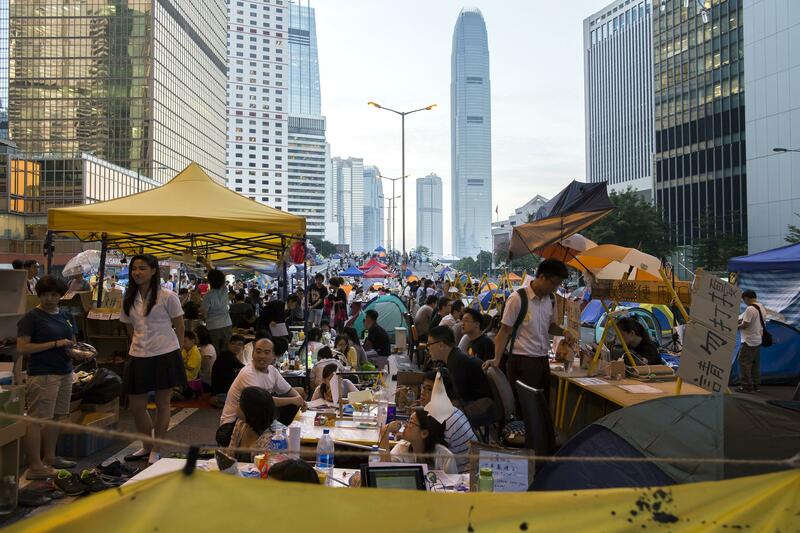 A “study area” for demonstrators in Hong Kong. Mr. Leung acknowledged that the protests that have shaken this autonomous Chinese territory for the past three weeks reflected not only broad demands for democracy but also economic grievances, notably the high cost of housing and limited social mobility for the young. Leung also said that “challenging the Hong Kong government at these difficult times will do no one any service,” but he didn’t make any definitive statement about how long demonstrators’ occupation of central public areas would be allowed to continue. Protests have become more tense and violent in recent days as police have begun taking down some protester-assembled barricades, and the premeditated beating of one activist was caught on video last week. This Vox piece puts the issues of candidate nominations and police violence in historical context, writing that both issues are important to Hong Kong residents not only in and of themselves, but also as tests of Chinese authorities’ willingness to crack down in a traditionally independent city where the Tiananmen Square massacres are still well-remembered. Correction, Oct. 20, 2014: This post originally misspelled Tiananmen Square.